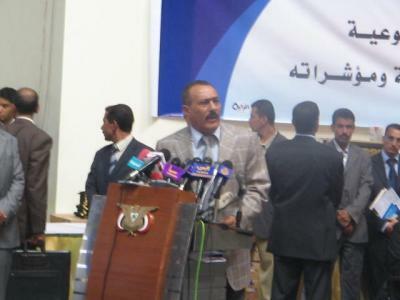 Almotamar.net, Saba - President Ali Abdullah Saleh attended on Wednesday a ceremony of rewarding top students in government universities for 2006-2007 academic year. In the ceremony was organized by Higher Education and Scientific Research Ministry on Education Day, president Saleh delivered a speech in which he congratulated graduates, highlighting their speeches which reflected their love and loyalty to the country. Today education is for all sons of the nation, president said, government spends around YR 272 billion for education. He affirmed importance of the human development as human being is the main wealth of the nation, calling on students to ignore who try to frustrate them. He said these few people are trying to damage democracy, freedom and unity of the nation and they received money in war of 1994. President Saleh also called on leadership of universities and ministry of education to strengthen national loyalty among students. Around 240,000 students were graduated from eight universities, he said. He also said that there are other five universities under construction. He pointed out to the announcement of ending war in Saada, saying many martyrs scarified their souls for the nation due to ignorance and call for imamate ruling. It is impossible to return imamate back to Yemen, president Saleh said. He called on newspapers to be careful while they publish news to make sure from credibility what they publish. He gave orders to the civil services and insurance ministry to employ 411 exemplary graduates next year as encouragement for them. He re- congratulated the students wishing them best luck in their life.